What is a VoIP Hosted PBX? Traditional business phone systems represent more than one kind of expense—and can be more costly than you’d think. With a closet or room full of telephone exchange equipment, the on-site model of the business phone system represents a large upfront and ongoing equipment cost. The maintenance and administration of on-site phone systems often require a staff of IT professionals. Your business phone system should contribute to the ongoing success of your business, rather than drain valuable resources away from more important initiatives. Voice over Internet Protocol(VoIP) is a method for taking analog audio signals, like the kind you hear when you talk on the phone, and turning them into digital data that can be transmitted over the Internet. Hosted PBX is a service where the call platform and PBX features are hosted at the service provider location. What if you could offload the day-to-day administration of your phone system? There are numerous tangible benefits of hosted PBX for business compared to a conventional phone system. More Flexible: Hosted PBX systems enable employees to work either in the office or from a virtual office without compromising the company’s image or service level. More Scalable: A VoIP Hosted PBX system easily scale to meet your demands. So, if you’re a one-person office today and a 50-person office next year, the only equipment you would have to purchase would be your IP phones. More Economical: No hardware means no system maintenance expenses. And, with VoIP, you always have access to the most current features and functionality since your phone system is upgraded in the cloud. We do the maintenance for you so you no longer need an IT staff to maintain your phone system. And our prices are lower than analog too! More Powerful: With a VoIP Hosted PBX system, there are unlimited options for how to route your calls. Yes, unlimited! Why? Being digital, VoIP can be programmed to do just about anything you might need your phone system to do. More Secure: Hosted PBX system are typically setup on redundant servers at separate data centers that are accessed via a secure data connection. Backups are maintained for you and when your internet goes down, calls can be easily routed to cell phones or alternate locations. Conference Bridge Hunt Groups…. and many more! As confusing as it all might seem, there are only two types of VoIP PBX systems: on-premise VoIP PBX or hosted VoIP PBX. Here is a quick overview of the pros and cons. Only an informed customer can make the right decision for themselves, their company, etc. We want you to have access to all the information you need to make the best decision possible for your organization—whether you want full control and responsibility over your phone system or you prefer to outsource it to a hosted PBX provider. (You can get you up and running with Press8 in less time than you may think. 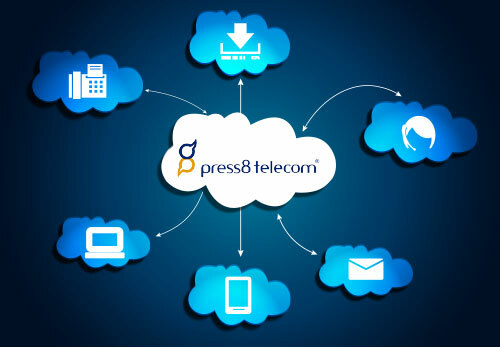 We invite you to watch our Video Tutorials so you can see how the Press8 hosted PBX system might work for you. Of course, should you be ready for a more personal experience, you can contact us directly to speak with a hosted PBX system expert or request a personal demonstration. With a VoIP hosted PBX there is no equipment to purchase or maintain. All software is hosted in the cloud. Typically, a VoIP hosted PBX implementation is significantly more cost-effective over the long run than a traditional analog PBX. With a VoIP hosted PBX, employees can work from anywhere there is a high-speed internet connection. With a VoIP hosted PBX, your business can get phone numbers in cities where you are not physically located which can help your business create a local presence anywhere. For small businesses VoIP gives instant credibility by presenting customers with a professional sounding telephone solution with enterprise phone system features. With a traditional phone system, when you want to add a new user you typically have to add new hardware. With a hosted PBX adding or removing users is fast and easy. VoIP hosted PBX systems are hosted in the cloud making it fast and easy to setup a new account. VoIP hosted PBX systems typically come with a web-based control panel. With it, customers can manage, monitor and make changes to their phone system without needing any specialized skills or experience. With our proprietary Auto Expanding Lines your customers will never get a busy signal. We will allocate extra lines for you during peak call times.